The Problem: You want to impress your guests with your cooking skills, yet you can hardly boil water. 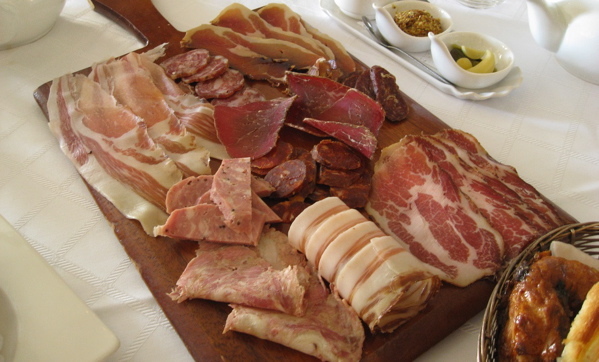 The Solution: A charcuterie plate: Because nothing’s better than cured meat glistening with ribbons of fat. Most gourmet food shops and some butchers carry sliced charcuterie. The Meats: Try coppa – cured pig’s neck or shoulder. It’s sweet and mild and sold paper-thin, like prosciutto, but less common. A leaner option is beef bresaola, which has a more robust flavour. Spanish chorizo, a firm pork sausage made with smoked paprika, will bring varying levels of sweetness and spice to your meal, depending on which kind you choose. Headcheese, which has nothing to do with cheese and everything to do with head, is made with the face of a cow or pig, and is usually preserved in the animal’s own gelatin. It’s an acquired taste. Round things off with a French rillette, which like an inexpensive pâté. Rillette is usually made by compressing cooked pork or poultry under a layer of fat. For bonus foodie points, go for cured venison, rabbit or ostrich. Or make your own duck rillette using Gordon Ramsay’s recipe or, easier, Chipotle Beef Jerky. again I think the best way to prepare a charcuterie plate is either you buy it prepared or have someone like lara do it for you!